If you have any extra dog fur you don't know what to do with, hang on to it. 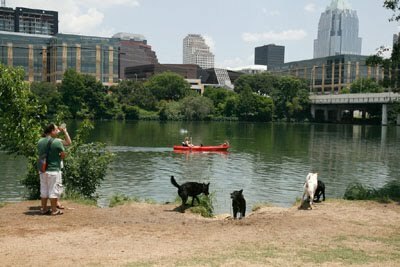 Austinites are fixing to create the world's largest dog fur ball. To set the Guinness record for world's biggest fur ball will take a better-than-67-pound clump of dog fuzz. Just when you thought tony Austin was losing its grip on weird. New York has the Statue of Liberty; Paris has the Eiffel Tour. We get a huge collection of puppy shavings. "It's a fun concept because it's simple and visual and disgusting, and people like that," said Sheri Soltes, founder and president of Texas Hearing & Service Dogs, the organization working on the ball. It would have been better if they were chasing the world's largest hair ball yakked up by Austin cats, but you work with what you've got. So where will you put your fur? There will be a so-called Fur-O-Sphere at the 14th annual Mighty Texas Dog Walk on April 7 at Auditorium Shores. The Fur-O-Sphere, which is currently being built, will be a 5-foot-wide and 5-foot-tall clear ball in which dog owners will deposit their dogs' clippings.